If you are Mobile Banking users than here is the good news for you! Reserve Bank of India increased the transaction limits for mobile banking five times, Now all Banks are permitted to offer mobile banking to their customers subject to a daily cap of Rs.50,000 per customer for transactions on-line shopping and involving purchase of any goods or services, as well as funds transfer. Currently, all the mobile banking transactions are limited to caps of Rs.5000 for fund transfer and Rs.10000 for on-line shopping. The Reserve Bank of India also allowed the use of mobile phones for cash remittances. All Banks in India will now be able to provide fund transfer services that let customers transfer funds from their accounts for delivery in cash up to Rs.5000. The RBI also relaxed the technology and security standards and allowed banks to undertake transactions up to Rs.1000 without end to end encryption. 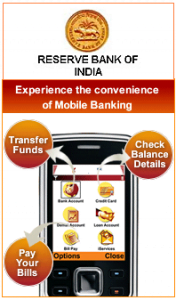 Mobile banking provided by SBI, IOB, ICICI, HDFC(through ngpay), and may be some other banks. A specific application provided by respective bank. through the application some limited transaction can made, i.e. fund transfer, prepaid mobile recharge, billpay to “REGISTERED BILLER”, a/c inquiry. There is no flexibility of payment to all online transaction. whats difference between phone banking n mobl banking coz both use phones. i hv used phone bnk but not aware of mbl bankng! thanx.